CAU research team proves for the first time that host organisms can control the function of their bacterial symbionts. In modern life sciences, a paradigm shift is becoming increasingly evident: life forms are no longer considered to be self-contained units, but instead highly-complex and functionally-interdependent communities of organisms. The exploration of the close links between multi-cellular and especially bacterial life will, in future, be the key to a better understanding of life processes as a whole, and in particular the transition between health and illness. However, how the cooperation and communication of the organisms works in detail is currently still largely unknown. An important step forward in deciphering these multi-organism relationships has now been made by researchers from the Cell and Developmental Biology working group at Kiel University’s Zoological Institute: the scientists, led by Dr. Sebastian Fraune, have been able to prove for the first time that host organisms can control not only the composition of their colonizing bacteria, but also their function. The CAU researchers published their ground-breaking findings – derived from the example of the freshwater polyp Hydra and their specific bacterial symbionts – last Monday in the latest issue of the scientific journal Proceedings of the National Academy of Sciences. “The starting point of our investigation was the observation that Hydra can influence the composition of species-specific bacterial colonisation, by the formation of certain antimicrobial substances,” explained Dr. Cleo Pietschke, lead author of the study. In principle, these simple life forms thereby manage the same task that higher-developed organisms must also accomplish to establish a healthy microbiome: using their immune system, they ensure colonisation by the “right” composition of bacteria, and must at the same time prevent useful microorganisms from having a harmful effect. The work presented focussed on how this colonisation process is supported by the communication between host and bacteria. Once a specific population density has been reached, bacterial communities can work together in teams, in order to fulfil certain functions. The coordination of these functions is based on a sensor mechanism, with which the individual bacteria can determine total population density with the help of signal molecules. Once a threshold value is reached, these signal molecules activate genes, and thereby regulate certain cellular functions. Using this process, known as quorum sensing, bacteria control functions such as the colonisation of surfaces, or the production of toxins. The Kiel research team has now shown that the host organism can change the quorum sensing mechanism of the bacteria. 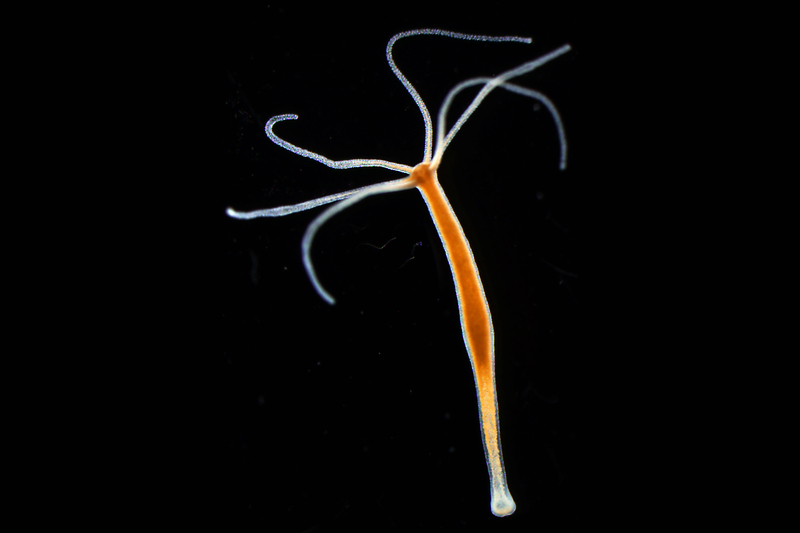 The cnidarians thereby directly influence the bacterial signal molecules, and thus actively promote the colonisation process of their own tissue. “We have found that Hydra not only influences the presence of their bacterial symbionts, but can also directly interfere with their function,” emphasised Fraune, research associate in the Cell and Developmental Biology working group. The research team described in detail, for the first time, a host using quorum quenching to inhibit the molecular communication of bacteria. Previously there were only two other examples of such interventions by a host organism. Specifically, the Kiel researchers proved that a modification of certain signal molecules by the host promotes colonisation by Curvibacter, the most frequently-occurring bacteria associated with Hydra. The CAU researchers studied the influence of the host mechanism on its bacterial community by observing the effect of a signal molecule and its host-modified bacterial counterpart. Firstly, they brought germfree Hydra, i.e. laboratory-bred organisms without bacterial colonisation, into contact with Curvibacter bacteria. It was evident that the bacterial colonisation was poor, as long as non-modified signal molecules were present. As soon as these became modified by the influence of the host organism, the bacteria colonised the body of the cnidarians to a normal extent. The researchers then repeated the experiment on organisms that already displayed bacterial colonisation. The same pattern emerged here, too: only the host-modified signal molecules encouraged consistent and typical colonisation of the Hydra by their bacterial symbionts. Further studies are required to determine how these results, obtained from cnidarian model organisms, can be applied to other life forms. However, since Hydra are primitive evolutionary organisms, it is likely that this mechanism is also similarly present in highly-developed organisms. “At the interface between basic research and medicine, it is becoming ever clearer that the key to health lies in the balance between the body and bacterial symbionts. In the future we have the challenging task of trying to understand the highly complex relationships between hosts and bacteria. With our new findings, we are a small step closer to achieving this,” said an optimistic Fraune. In Kiel, around 70 scientists are studying the multi-organismic relationships between the body and microorganisms, together in the Collaborative Research Centre (CRC) 1182 “Origin and Function of Metaorganisms”. This work was funded by the German Research Foundation (DFG) as part of the project “Host derived mechanisms controlling bacterial colonisation at the epithelial interface in the early branching metazoan Hydra (FR 3041/2-1)” and by the Cluster of Excellence “Inflammation at Interfaces” at Kiel University. Caption: The freshwater polyp Hydra. 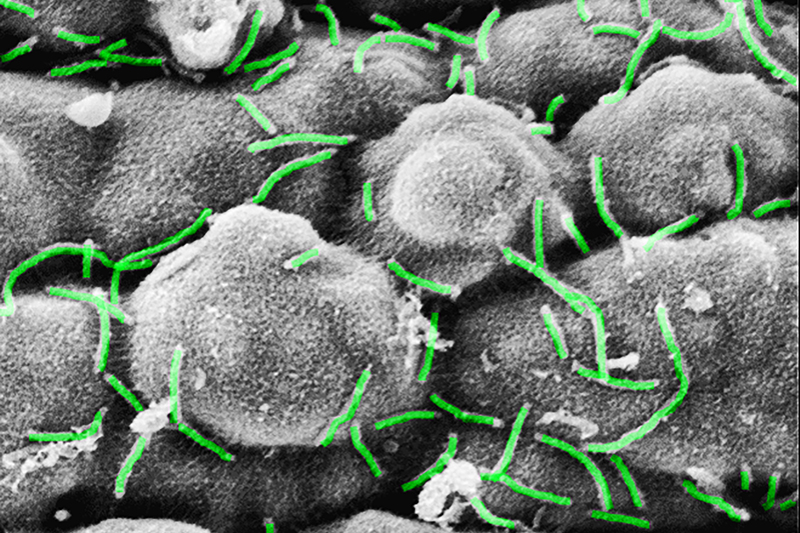 Caption: Electron microscopic image of the bacterial communities (Curvibacter sp.) on the surface of Hydra.